Bone sarcomas affect approximately 580 people in the UK each year, making it a very rare form of cancer. Not all bone cancers will be sarcomas. Bone sarcoma is linked to age and unusally for cancer it is more commin in older children and teenagers and becomes morec common again in older people. 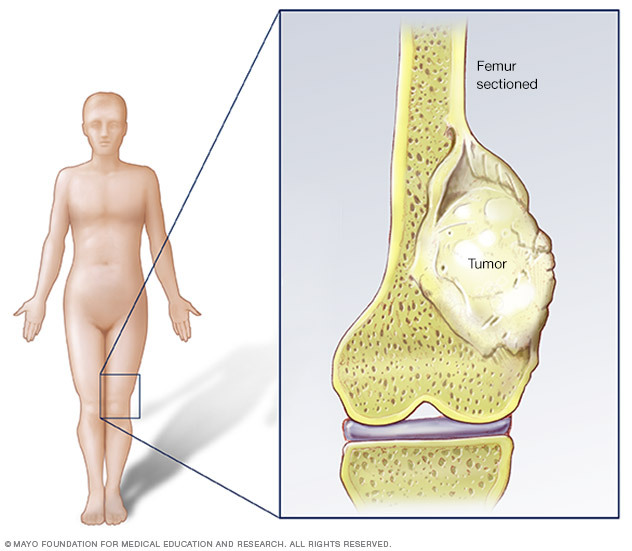 The main types of bone sarcoma include osteosarcoma, Ewing's sarcoma and chondrosarcoma. Other types include spindle cell carcoma, undifferentiated sarcoma of the bone, fibrosarcoma and leiomyosarcoma of the bone. Treatment depends on the type of cancer, where it is, how far it has grown or spread, the grade and the person's general health and fitness level. The main treatments are surgery, chemotherapy and radiotherapy. Surgery and chemotherapy are the most common treatments for sarcoma. However, radiotherapy is an important treatment for Ewing's sarcoma. No UK-wide statistics are available for bone cancer survival. The following statisitics are for people diagnosed with primary bone cancer in England between 1999 and 2013 and followed up between 2009 to 2013. Generally around 75% diagnosed with sarcoma survive their cancer for 1 year or more after diagnosis. More than 50% will survive their cancer for 5 years or more. 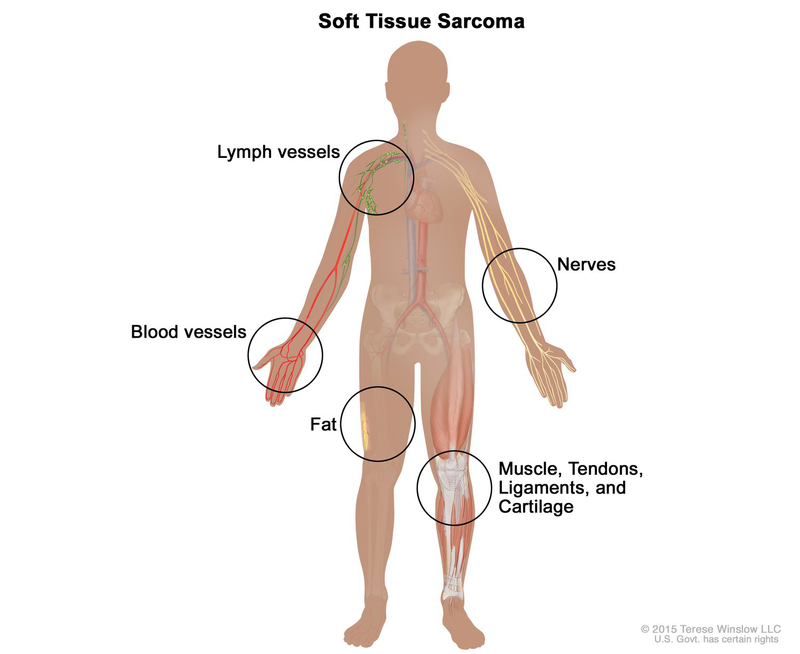 Soft tissue sarcomas are cancers that develop from soft tissue. Soft tissue is a term used to describe all the supporting tissues in the body (apart from the bones) including fat, muscle and nerves. Soft tissue in all parts of the body so these sarcomas can develop and grow almost anywhere. They are rare cancers with around 3300 people diagnosed each year in the UK. The type of soft tissue sarcoma depends on the type of cell that the cancer started in. Leiomyosarcoma is the most common type with around 600 cases diagnosed each year. They develop from smooth muscle cells. Liposarcomas develop from fatty tissue and around 440 people are diagnosed each year. Fibroblastic sarcomas grow from cells in fibrous tissues and most commonly found in the arms or legs. Around 460 cases of fibroblastic sarcoma are diagnosed in the UK each year. Rhabdomyosarcomas develop from skeletal muscle cells and around 120 people are diagnosed each year. 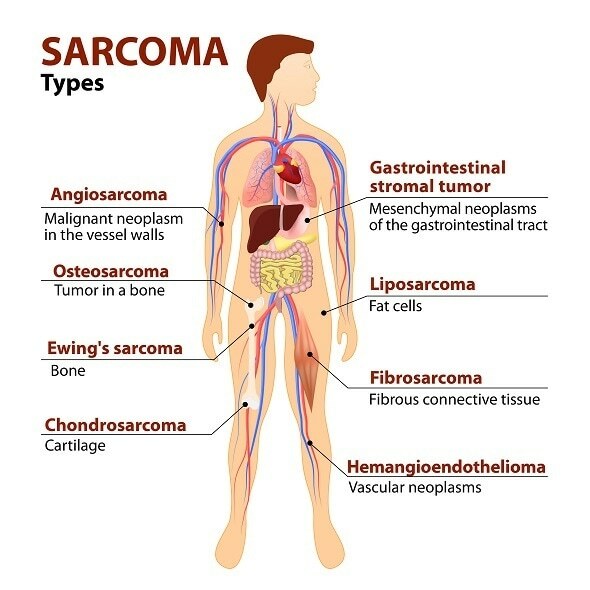 Other types of soft tissue sarcoma include soft tissue Ewing's sarcomas, synovial sarcomas, vascular sarcomas, malignant peripheral nerve sheath tumours, gastrointestial stromal tumours (GISTs), angiosarcoma of the heart and Kaposi's sarcoma. Treatment for soft tissue sarcoma depends on where the cancer is, how far it has grown or spread, the type of cancer, the grade and the individuals health and level of fitness. The main treatments for soft tissue sarcoma include surgery, radiotherapy, chemotherapy and biological therapy. For small, localised sarcomas surgery is the main treatment option but may have radiotherapy after if surgeon unable to fully remove the tumour with a wide border of healthy tissue containing no cancer cells. For large tumours that have not spread patients may have radiotherapy or chemotherapy before surgery but this is dependent on the type of sarcoma. If the sarcoma has spread, surgery may be used to remove the areas of spread. This can help to relieve symptoms and keep the cancer under control for longer. Patients may also have chemotherapy, radiotherapy or any combination. Patients with GIST may have biological therapy. Overall survival for soft tissue sarcoma depends on which type you have. For leiomyosarcomas for example almost 50% of people will survive their cancer for 5 years or more after diagnosis. This does depend on which part of the body is affected. The outlook for liposarcoma depends on the type of liposarcoma and where it is in the body. Almost 90% with well differentiated liposarcoma survive their cancer for 5 years or more. The outlook for fibroblastic sarcoma depends on the type and whereabouts in the body it is. For dermatofibrosarcoma around 99% will survive their cancer for 5 years or more, for myxofibrosarcoma around 75% will survive their cancer for 5 years or more, for malignant fibrous histiocytoma 60% of people will survive their cancer for 5 years or more and for those with fibrosarcoma 60% will survive their cancer for 5 years or more. For rhabdomyosarcoma survival depends on the type of rhabdomyosarcoma and the patients age. For embyonal rhabdomyosarcoma 60% survive their cancer for 5 years or more, for alveolar rhabdomyosarcoma more than 30% will survive their cancer for 5 years or more and for pleomorphic rhabdomyosarcoma around 30% survive their cancer for 5 years or more after diagnosis. For soft tissue Ewing's sarcoma more than 40% survive their cancer for 5 years or more, for synovial sarcoma almost 60% survive their cancer for 5 years or more, for angiosarcoma around 30% will survive their cancer for 5 years or more, for Kaposi's sarcoma more than 75% survive their cancer for 5 years or more and for nerve sheath tumours more than 50% will survive their cancer for 5 years or more after diagnosis.